Describe how pre-rRNAs and pre-tRNAs are processed into mature rRNAs and tRNAs. The tRNAs and rRNAs are structural molecules that have roles in protein synthesis; however, these RNAs are not themselves translated. In eukaryotes, pre-rRNAs are transcribed, processed, and assembled into ribosomes in the nucleolus, while pre-tRNAs are transcribed and processed in the nucleus and then released into the cytoplasm where they are linked to free amino acids for protein synthesis. The four rRNAs in eukaryotes are first transcribed as two long precursor molecules. One contains just the pre-rRNA that will be processed into the 5S rRNA; the other spans the 28S, 5.8S, and 18S rRNAs. Enzymes then cleave the precursors into subunits corresponding to each rRNA. In bacteria, there are only three rRNAs and all are transcribed in one long precursor molecule that is cleaved into the individual rRNAs. Some of the bases of pre-rRNAs are methylated for added stability. Mature rRNAs make up 50-60% of each ribosome. Some of a ribosome’s RNA molecules are purely structural, whereas others have catalytic or binding activities. The eukaryotic ribosome is composed of two subunits: a large subunit (60S) and a small subunit (40S). The 60S subunit is composed of the 28S rRNA, 5.8S rRNA, 5S rRNA, and 50 proteins. The 40S subunit is composed of the 18S rRNA and 33 proteins. The bacterial ribosome is composed of two similar subunits, with slightly different components. The bacterial large subunit is called the 50S subunit and is composed of the 23S rRNA, 5S rRNA, and 31 proteins, while the bacterial small subunit is called the 30S subunit and is composed of the 16S rRNA and 21 proteins. The two subunits join to constitute a functioning ribosome that is capable of creating proteins. Each different tRNA binds to a specific amino acid and transfers it to the ribosome. Mature tRNAs take on a three-dimensional structure through intramolecular basepairing to position the amino acid binding site at one end and the anticodon in an unbasepaired loop of nucleotides at the other end. The anticodon is a three-nucleotide sequence, unique to each different tRNA, that interacts with a messenger RNA (mRNA) codon through complementary base pairing. There are different tRNAs for the 21 different amino acids. Most amino acids can be carried by more than one tRNA. Structure of tRNA: This is a space-filling model of a tRNA molecule that adds the amino acid phenylalanine to a growing polypeptide chain. The anticodon AAG binds the codon UUC on the mRNA. The amino acid phenylalanine is attached to the other end of the tRNA. In all organisms, tRNAs are transcribed in a pre-tRNA form that requires multiple processing steps before the mature tRNA is ready for use in translation. In bacteria, multiple tRNAs are often transcribed as a single RNA. The first step in their processing is the digestion of the RNA to release individual pre-tRNAs. In archaea and eukaryotes, each pre-tRNA is transcribed as a separate transcript. The processing to convert the pre-tRNA to a mature tRNA involves five steps. 1. The 5′ end of the pre-tRNA, called the 5′ leader sequence, is cleaved off. 2. The 3′ end of the pre-tRNA is cleaved off. 3. In all eukaryote pre-tRNAs, but in only some bacterial and archaeal pre-tRNAs, a CCA sequence of nucleotides is added to the 3′ end of the pre-tRNA after the original 3′ end is trimmed off. Some bacteria and archaea pre-tRNAs already have the CCA encoded in their transcript immediately upstream of the 3′ cleavage site, so they don’t need to add one. The CCA at the 3′ end of the mature tRNA will be the site at which the tRNA’s amino acid will be added. 4. Multiple nucleotides in the pre-tRNA are chemically modified, altering their nitorgen bases. On average about 12 nucleotides are modified per tRNA. The most common modifications are the conversion of adenine (A) to pseudouridine (ψ), the conversion of adenine to inosine (I), and the conversion of uridine to dihydrouridine (D). But over 100 other modifications can occur. 5. A significant number of eukaryotic and archaeal pre-tRNAs have introns that have to be spliced out. Introns are rarer in bacterial pre-tRNAs, but do occur occasionally and are spliced out. After processing, the mature pre-tRNA is ready to have its cognate amino acid attached. The cognate amino acid for a tRNA is the one specified by its anticodon. Attaching this amino acid is called charging the tRNA. In eukaryotes, the mature tRNA is generated in the nucleus, and then exported to the cytoplasm for charging. Processing of a pre-tRNA. : A typical pre-tRNA undergoing processing steps to generate a mature tRNA ready to have its cognate amino acid attached. Nucleotides that are cleaved away are shown in green. Chemically-modified nucleotides are in yellow, as is the CAA trinucleotide that is added to the 3′ end of the pre-tRNA during processing. 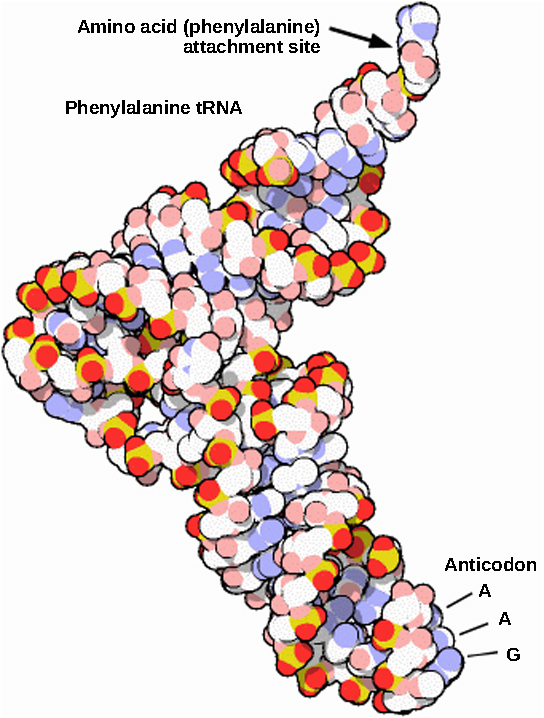 The anticodon nucleotides are shown in a lighter shade of red. Ribosomal RNA (rRNA) is a structural molecule that makes up over half of the mass of a ribosome and aids in protein synthesis. Transfer RNA (tRNA) recognizes a codon on mRNA and brings the appropriate amino acid to that site. rRNAs are processed from larger pre-rRNAs by trimming the larger rRNAs down and methylating some of the nucleotides. tRNAs are processed from pre-tRNAs by trimming both ends of the pre-tRNA, adding a CCA trinucleotide to the 3′ end, if needed, removing any introns present, and chemically modified 12 nucleotides on average per tRNA.